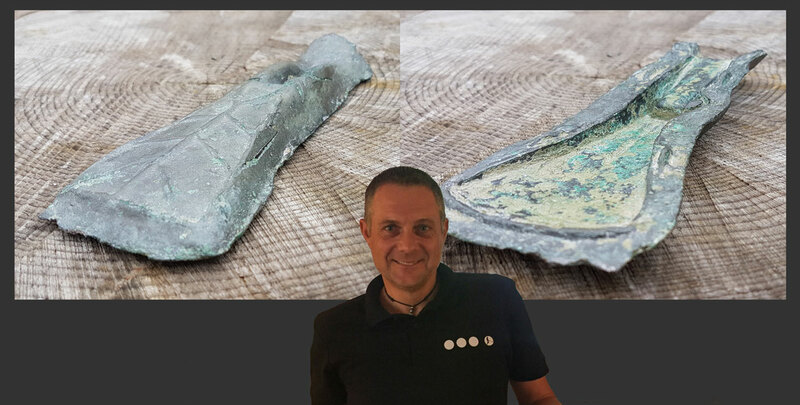 To discover a mould for an Bronze age axe head is a very rare find, in the same week we had 2 reports from Deus users, both from different parts of the country. Bronze axe heads were made by casting, early examples appeared to be very similar to its stone predecessors but then evolved and developed a socket for the wooden handle to fit into, and a small loop or ring to make lashing the two together easier. Groups of unused axes are often found together, suggesting ritual deposits to some, though many archaeologists believe that elite groups collected bronze items, perhaps restricting their use among the wider population. Our first find was from a good friend and member of our XP test team Gary Cook, here is his story. I was out on a local permission of mine using my Deus with the 11″ coil and version 4, I was using a 2 tone program with a discrimination of 5.5. After about an hour I had a few Roman Grots in my bag when I get a clear loud signal reading about 95 on the Remote. 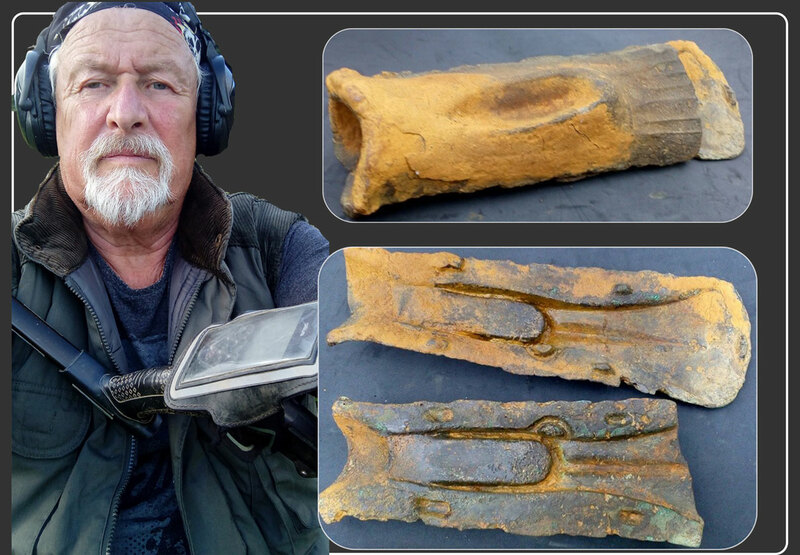 Thinking it was a large piece of lead imagine my shock when only 2 ” below the surface I see what I think at first is an Axe Head. On Closer inspection I can not believe what I am looking at it’s a Mould for a Palstave Axe Head. Extremely Rare and in fantastic condition, Its dated from around 1800 to 2500 BC. I wonder how many Axe Heads it has made. Another Great find for my Deus. After about 40 minutes he finally headed back to the gate, I opened the gate for him and asked for two minutes of his time. I t turned out he was very interested in what I had to say and very knowledgeable about the area in general and gave me permission to go on his land wishing me well before driving off. Having my Deus and all my gear in the boot I set off across the first field, at less than an hour into searching I received a cracking signal, registering in the early nineties on my machine. I carefully started digging down and after 10 inches down the soil layer turned into clay and sand. At around 16 to 18 inches I was about to give up, but with my next spade full of earth I unearthed 2 large pieces of metal side by side, I could clearly see bronze on one of them. I removed them carefully having no idea what they were, they were very heavy and caked in clay. After a further 45 minutes with these heavy weights dragging my bag down I decided to head home and see what I had. After carefully washing the mud and clay away I sent a picture to my son who recognized them immediately for what they were, both halves of a Bronze Age Palstave Axe head mould. One week later they are now in the hands of an excited FLO (Finds Liaison Officer) and I am busy searching for more but without much luck.What a fascinating hobby metal detecting is as you never ever know what that signal is going to be when you detect something. And who knows what will appear next. Program number 10 on the Deus is called Goldfield is one of your deepest programs, it uses less filtering than the discriminating programs such as GMP and Deus fast. Disc IAR is an iron rejection and at a maximum setting of 5 it will reject most Iron. Using Goldfield for hoard hunting takes a little practice but is well worth the effort. Make sure you get an exact ground balance by pumping and pressing the pin point button. 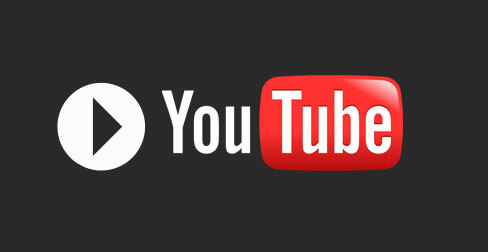 Here is a video explaining Goldfield in more detail.